Take a look at the constantly updating Bookmaker bonus offers. New players and re-load bonuses are constantly available. 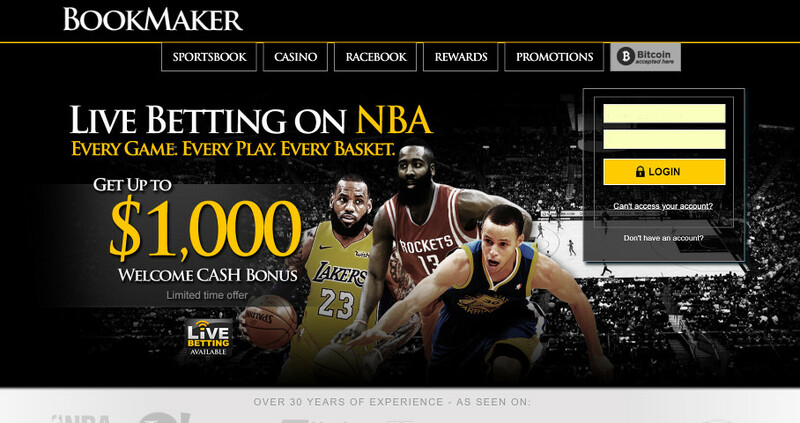 A few things to note about Bookmaker, depending on how you deposit and which bonus offer you choose will determine what kind of bonus you get. 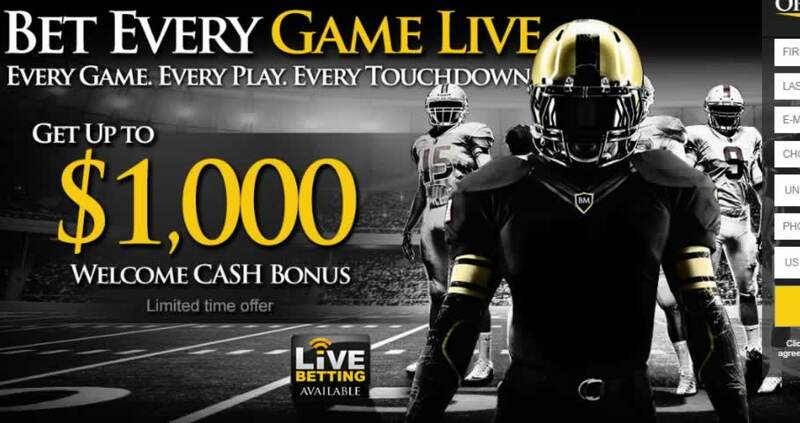 The good news is there are plenty of real money bonuses (CASH) bonuses instead of un-cashable ‘free play’ bonuses you find at other sportsbooks. Plus, the rollover requirements are pretty good, especially for sports betting. Additionally, you can choose no bonus offer and have no strings attached to withdrawals, rollover requirements or things like that. The choices are yours at Bookmaker. Just a head’s up. 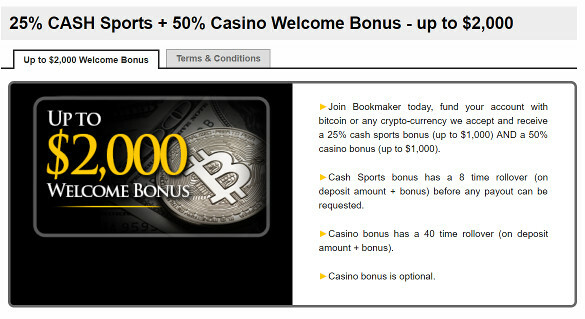 The people at Bookmaker seem to be moving away from traditional forms of cash and moving more toward crypto-currency. The good news? They seem to accept any type you’d like to use! As of this writing, they are accepting 25 different types from the most popular (bitcoin) to the more obscure (WeTrust) and everything in between! Now, we don’t want to speak to much about them and their practices here, we’ll leave that up to the guys at GoodSportsBooks. But rest-assured, there are reasons that BookMaker has been supported by us for years, and will continue, barring any serious changes. This is a good bonus here. You’re able to use it for whatever you want, be it sports, casino, bingo, horses, whatever you like. The initial deposit must be made with a crypto-currency. Both new and existing customers are able to take advantage of this! Just as they say. 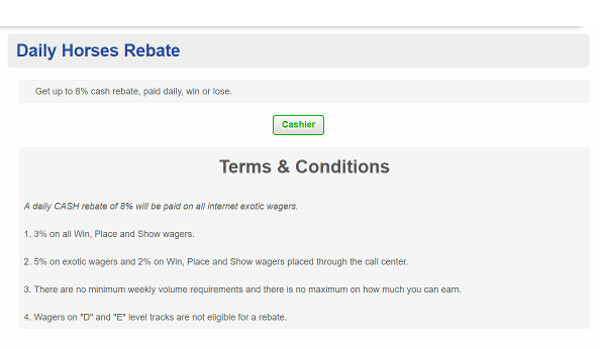 Get up to an 8% rebate for your horse racing fix! Up to $500 for use on the slots! The minimum deposit is $25, the maximum is $250 and can be used for either Blackjack or Video Poker. Use the code BIT1000 to claim a 100% bonus for use on the slots. Deposit must be made with bitcoin or other crypto methods. Minimum deposit of 25$ needed to claim the bonus and according to their website you’ve got 72 hours to use the bonus before it disappears. Deposit $300 or more on any given Wednesday and receive 5 free spins on one of their selected Slot Games. To grab the free spins, simply make a deposit and then reference that deposit to the casino department so they can give you the spins. For this bonus just select the code “BLACK-N-JACK” in the cashier at the time of your deposit. 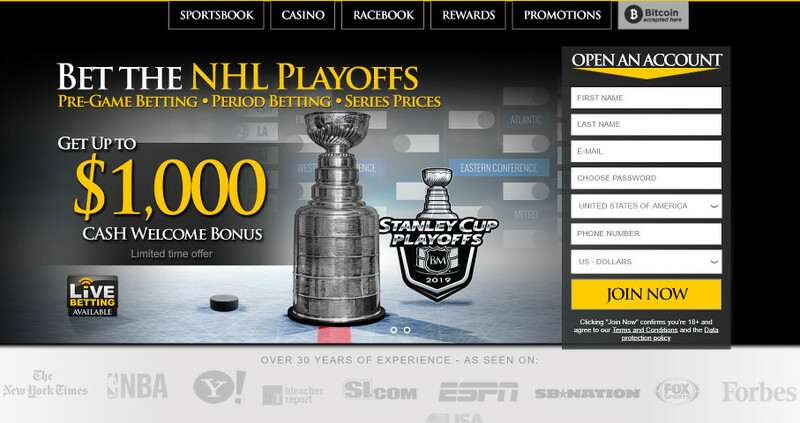 Most Online Sportsbooks have some sort of Loyalty Rewards Program and BookMaker is no exception to the rule. This one is pretty decent however with even the lowest tier coming attached with some good perks involved. For every reload of $300 or more, receive a 10% cash deposit bonus. For every reload of $300 or more, receive a 15% cash deposit bonus. And they are known for setting the lines. If you like to get in on the earliest lines possible then it is critical that you have a Bookmaker account. They have a customer service style unlike other sites… They are much more direct, blunt and in your face. You’ll get answers, even if they are not what you want to hear. This is not to say that they are rude, but they are direct. Works for me. Ready to play? Visit Bookmaker here and get signed up!